2 Year Manufacturers Warranty, excluding probes & LCD display panel. The new GW Instek series of desktop battery testers, the GBM-3000 series, measures both battery voltage and internal resistance to 300V (GBM-3300) and 80V (GBM-3080). The series features a 3.5" TFT LCD, 4-wire measurement method, high-resolution (6-digit voltage / 5-digit resistance) measurement display capability, and independent GO/NOGO determination of voltage and resistance. The GBM-3000 Series is suitable for various types of battery measurements, ranging from single cell, battery cell, to the end product (battery), etc. so as to facilitate users in achieving accurate measurements at all stages of production. 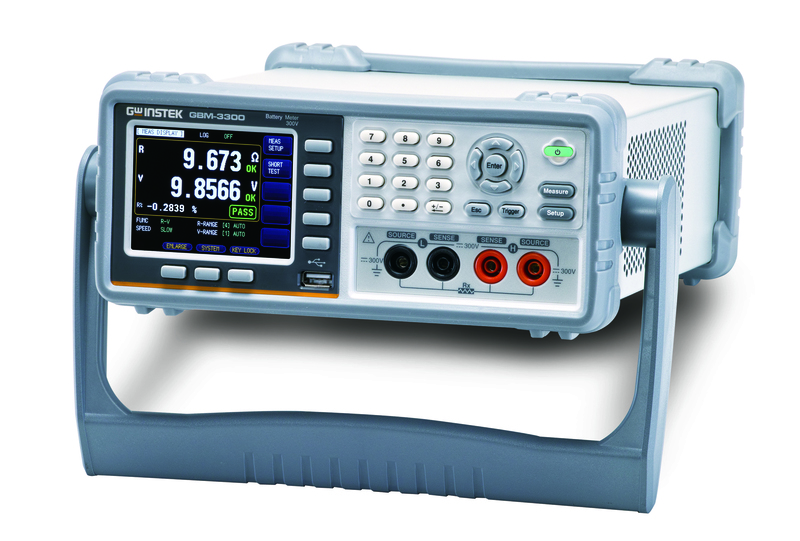 For voltage measurement, the accuracy is as high as ± (0.01% reading + 3 digits), and measurement resolution is up to 10 V (at 8V). For resistance Ω measurement, the accuracy reaches ± (0.5% reading + 5 digits) and the resolution achieves 0.1 (at 3m ). This is especially suitable for the sorting of single cell measurements, which in turn achieves a better output balance for the follow-up series and parallel connections. In the meantime, in order to facilitate users to quickly and clearly interpret the measurement results, the GBM-3000 series features HI/LO determination respectively based on voltage and resistance. The display can be switched to the simple (big numerical display) mode to meet the requirements of test accuracy, clear and easy-to-read, and elevated inspection efficiency and capabilities. In addition, for retrieving and storing measurement results via the transmission method, the GBM-3000 series provides RS-232C/USB device (virtual COM) for writing programs and retrievals. The handler interface is provided for external trigger control via a PLC. All interfaces are standard-equipped that not only save the cost of instruments, but also meet the requirement of using different automated measurement systems. Weiterführende Links zu "GW-GBM-3300 Battery Tester"